So, a while back a colleague mentioned Cloud Camp to me as it was being organised by Microwarehouse who we work with on all things Microsoft Azure. I haven't previously been one for attending conferences (I've always been happier hammering my keyboard and fighting with my code) but I checked out the planned talks, saw a few that interested me and decided I'd go along if my work schedule would allow. I'm glad that it did! I arrived over to The Convention Centre shortly before 9 am, swapped my ticket for a conference lanyard and settled down in the main hall ready for kick-off. Aidan Finn from Microwarehouse opened proceedings with the morning keynote, setting out the agenda for the day. I'd met Aidan previously at Arekibo HQ when he was helping us prepare aspects of our own infrastructure migration to Azure. I was impressed by his helpfulness and knowledgeability then and this perception was reinforced from his opening address. He spoke about the relative lack of change in the IT industry in the last 30 years and how the advent of Cloud technologies is comparable to another industrial revolution. Digital Transformation was the phrase of the day. Aidan referenced the fact that 2.5 quintillion (way too many zeros!) bytes of data is created daily and this number is only increasing. Along with this the technology landscape is changing at a phenomenal rate. This rate of change is putting a lot of pressure on businesses and tech teams to keep up and the days of going on a training course every few years are gone. Companies and individuals must learn constantly to stay up to date and relevant. He also showed a very interesting video featuring Rolls Royce and how they use the Azure IoT suite to handle data from thousands of sensors on their jet engines. They process this data in the cloud and use it (through Machine Learning tools) to identify patterns to predict maintenance issues before they happen (so they can be proactive about addressing them) as well as providing tools to pilots for optimising their fuel loads based on conditions etc. My main takeaway point from the keynote was the sheer volume of possibilities with the services Microsoft offer in Azure and how we (and most people) are probably only scratching the surface. The rest of the day was broken into 4 topics; IaaS, PaaS, Productivity & Security and Windows Server 2019 and Hybrid. There were five separate sessions during the day with a talk on each topic. Unfortunately, I haven't quite mastered my powers of bi-location yet so I had to pick only one talk per session. The first talk I attended was from Eldert Grootenboer who discussed cloud architectures for enterprise. He stressed the importance of knowing the available services within Azure (150+) and using that knowledge to best inform the solution for a given scenario. He ran through several scenarios from previous projects where, based on the client requirements, a different set of azure tools were employed to solve the problem. He presented some interesting scenarios and highlighted some useful Azure services that merit further investigation. The key takeaway for me was switch to an Azure mindset for developing solutions. The system is designed to have multiple services connected or chained together and so we should be informed on what those are so that we can make the best choices for our work. Next up for me was Kevin Greene and his discussion of the various monitoring features available within Azure. Kevin covered a large amount of the available tooling within Azure for monitoring the services you have running. Microsoft have done a lot of work recently on their monitoring tools especially in collating and simplifying the views available. Monitoring views are available for Resource Groups, VMs, Apps, Network etc. There is a cost involved with different options, but it is certainly something worth looking into more closely and making some decisions about what to us to benefit ourselves and our clients. Some of the tools around Log Analytics, in particular, could be of use for us in identifying patterns and issues with certain sites or servers and deciding on the appropriate action to take. We broke for lunch (I had the chicken curry - my compliments to the Convention Centre catering staff!) for half an hour at 12:30 and then I was back in to a very informative (and entertaining) talk from Damian Flynn on Azure governance practices. He spoke about making proper use of the tools available within Azure to improve the culture of the organisation when it comes to dealing with cloud services. He stressed the need to get all the stakeholders together (not just the IT and Dev teams) to discuss the fears and desires relating to the use of Azure and drafting a governance document wherein the organisation can set out what they should and should not do within the Azure space. He then acknowledged that the reality is nobody will ever read that document! That's where Azures Management Groups and Policy tools come in. When properly used, they allow that governance document to be implemented directly within the system. For example, creating restrictions on the daily cost of a subscription or limiting the size or location of a VM. A properly implemented set of policies such as these will mean that the governance document cannot be avoided as it is baked into the subscription. This should then improve the collaboration within the team as people can be given the 'keys' to a subscription and can work freely within it while safely restricted by the policies set for it. So, IT or Finance wouldn't have to worry about a developer creating resources that are too expensive or in the wrong location as the facilities available to the dev would have been pre-agreed and the limitations 'baked in' to the service. A nice feature of the policies is that they show a compliance score. You can set your policies now (while you already have resources in place) without affecting your existing services and see a report of whether they adhere to your policies or not (thus flagging them for remedial action). My fourth talk of the day was with Gerald Versluis who discussed the world of Azure Functions and 'Serverless' architecture. In case you didn't know, 'Serverless' doesn't really mean serverless. It means you don't need to care about the server. It's a step beyond the Platform as a Service (PaaS) model where our fearless hero (the developer) has to worry about little else besides the code they write. 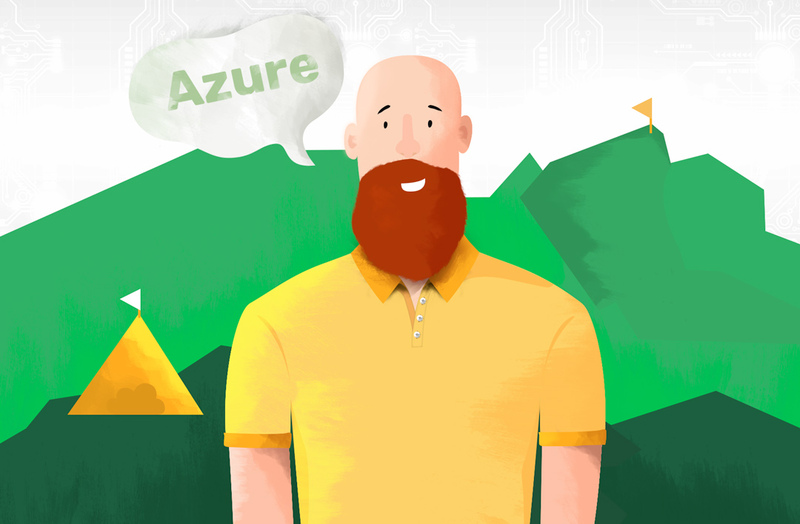 Azure's take on serverless architecture comes through Functions and using this system developers can implement small pieces of code, ideally with a single purpose, and have them run and scale without having to worry about the underlying system they are running on. Azure offers various configuration options and there is a decision to be made about what model best suits your needs, but a basic premise is that your function can scale appropriately in reaction to heavy use and shrink again afterward without you having to do anything. So if you had a web service that was only expecting occasional spikes in traffic (e.g. taking orders at lunchtime or over a holiday period) but quiet the rest of the time; you could potentially use an Azure Function (or set of functions) on a consumption based pricing plan to automatically react to the busy times while keeping costs to a minimum during the quiet periods. It's a service we are already using for some of our work and one that I can see many applications for with our clients. For the last breakout session, I listened to Pascal Naber discussing Kubernetes within Azure. Kubernetes is an orchestration system for Docker containers that takes a lot of the pain out of deploying and managing multiple of these containers in your environment(s). Azure now has built in support for it and Microsoft have a significant update in the pipeline to make the process even simpler. Pascal ran through several demos of how to configure and deploy some solutions and I was struck by the speed and simplicity of the system as a whole. It's certainly a system I'll be keeping in mind for our future projects. The closing keynote was delivered by Mary Jo Foley and Paul Thurrott who ran through a series of questions and war stories from their extensive time spent covering the 'Microsoft beat' in their respective journalistic roles. They had some interesting takes on past, current and potential future paths taken by Microsoft over the years and it was a nice, relaxed way to close out the day. So, having never done much conferencing before, I'm now hooked and already looking forward to the next Cloud Camp (as well as keeping an eye out for any others I can go to!). Many thanks to all involved for a well organised, interesting and fun day and special thanks to Arekibo for sending me over to the north (dark) side for the day! Arekibo are Microsoft Certified partners and provide a broad range of Azure based services to our clients. If you'd like to discuss a potential project, Get in Touch. Killian is Head of Technology at Arekibo. He has been coding for the web since a time when he still had hair and Notepad was the most sophisticated IDE.